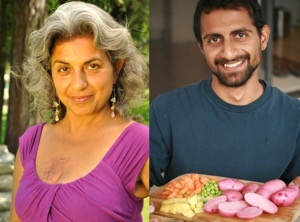 A Mother and Son Team, Pearl and Rishi Kumar Pearl Kumar is a gourmet chef, gardener, businesswoman, and speaker. She founded The Growing Home in 2010 at her house in Southern California. The Growing Home is a standard-sized suburban home converted into a farm and model of sustainability – harvesting rainwater and producing nearly 3000 pounds of food annually. Cooking great food is her passion, and Pearl teaches classes on preparing delicious Indian food using organic and local ingredients. Prior to The Growing Home, Pearl founded Charming Hawaii – a line of safe, fun, and high quality children’s jewelry with a tropical theme. She has also contributed as a writer and marketer to LocalBlu.com, Vision Magazine, The Whole Person, and The Conscious Life Expo. Rishi Kumar is a leading expert in the field of Urban Agriculture in the Los Angeles area. Over the last year and a half, he has worked to help disseminate knowledge about growing food in an urban environment through his main project, The Growing Home. The Growing home is a model of urban/suburban sustainable living. In a average size suburban lot, Rishi has transformed what was once an average suburban home into Los Angeles’ most diverse urban farm, with over 40 fruit trees, 50 varieties of vegetables and herbs, chickens, rabbits, bees, and more. Rishi has an engineering background. He graduated with a BS in Computer Science from UC San Diego in 2010. His first training in agricultural practices was at Vandana Shiva’s Navdanya Organic Farm in Dehradun, India. He is also a UC Cooperative Extension certified Master Gardener.